Similar with chess board, the checker board also consist of 64 squares, 32 white squares and 32 black squares. In the picture above is checker board with some checker pieces on it. Thick and strong. Perfect for use outdoor checker game such as at your garden, backyard, patio space and others. Wide board with black and white squares nice to put in our garden for outdoor game. Kids will like to play outdoor checker and enjoy it so much. Checker pieces and board are made from best quality Teak wood, the strongest wood in the world. So those products are very durable and qualified. They polished in glossy looks and attractive. We use best paint in order to make the product durable in any seasons and weathers. 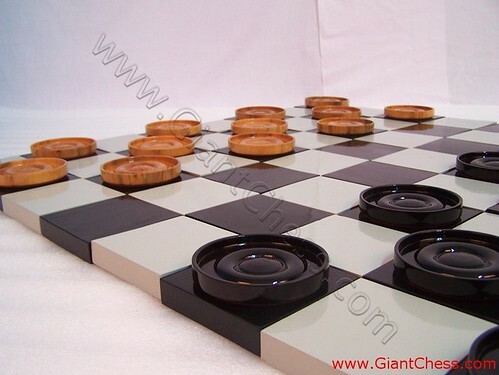 Order now to get good price from us as the chess and checker set manufacturer.